"Our friends at Stop Patriarchy are already in Texas changing the terms of the abortion debate. As many of us saw last year, Stop Patriarchy refuses to be muzzled by professional politicos insisting we follow focus-group approved talking points. They tell the truth: without the right to abortion, women are not free. They are out talking to people on the street, explaining that as of Sept. 1, the enormous state of Texas will have only 6 legal abortion clinics. Many people are unaware of how dire this emergency is." 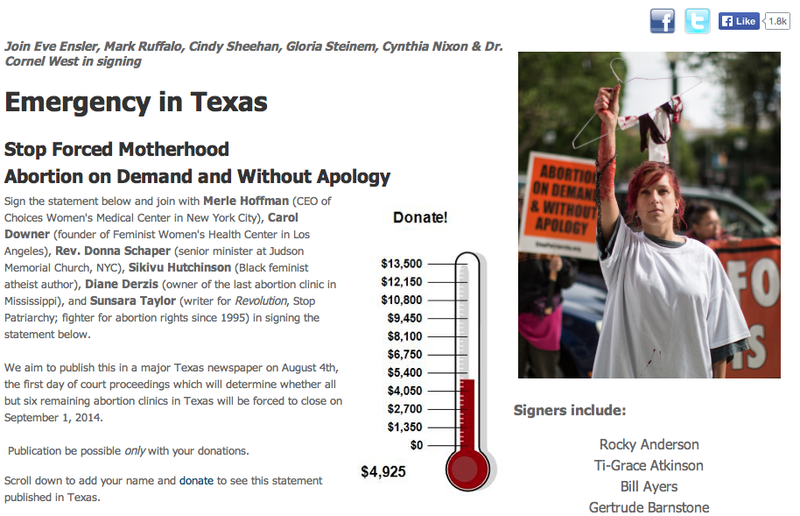 "If nothing changes, on September 1st all but six abortion clinics in Texas will be closed." Publication be possible only with your donations.